1. Celebrate your traditions. African-American culinary traditions are rich and full of interesting flavors. Ask your elders about the foods they ate as a child that kept them strong and healthy. Find ways to include those foods in your diet today. 2. Let your 5 senses guide you in the kitchen. For me, cookbook recipes are used as inspiration for what I do in my own kitchen. I love food that is colorful, has a pleasing texture or mouth feel, smells inviting, the sounds it makes while chopping or sauteing All of these elements are equally as important as taste. 3. Eat real food. I love convenience just as much as the next gal, but I prefer most of my food to not come from a plastic container. 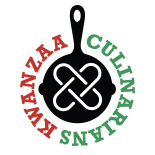 My challenge with writing this post for Kwanzaa Culinarians is that I have been fighting a bad cold that prefers to linger a little longer than I wanted. As a result, my senses are a bit dulled–or so I thought. My fiance served me up a spicy soup that pulled me out of the misery of my head cold. My chest opened up. My sense of smell perked up. I returned to the land of the living with one bite–at least momentarily. My fiance’s soup inspired this Sweet & Spicy Pot Liquor Soup. Pot liquor (or likker) is the liquid left in the pot after boiling greens and meats. I remember my grandfather, affectionately called PopPop, used to tell me stories about how pot liquor saved his life. As the youngest child in his home, he was the last to be served a plate. By the time the pot got to him, there was nothing but the liquor left. And as PopPop tells it, he wound up being the tallest and strongest in the whole family. PopPop’s claim is not without merit. Pot liquor from greens is packed with iron, vitamin C, and K.
This recipe uses some of my favorite fresh ingredients–a soup anybody can easily recreate in her own kitchen. Collard greens will always be my favorite soul food staple. Roasted butternut squash is a new favorite of mine; a quick and easy vegetable that adds vibrant color and sweetness to your soup bowl. Freshly grated ginger and jalapenos perk up your nose and warms you from the inside out. A bit of turmeric gives the broth a golden hue. Serve with sliced cucumbers to cool your tongue. No need to wait for the flavors to mingle. This soup is ready to eat as soon as you can make it. Enjoy! Heat your oven to 400 F and roast your squash massaged with olive oil for 20 minutes, or until soft and golden. Remove and set it to the side. Heat up a large soup pot with olive oil. Once it is hot, add mushrooms and jalapenos. Saute for about 3 minutes. Add ginger and garlic to the pan. Saute until fragrant. Add broth, scraping the bottom of the pot to ensure caramelized food gets incorporated into the soup. Add turmeric. When the broth is hot, add collard greens. Allow the collard greens to cook in hot broth until tender (about 5 minutes). Add butternut squash. Taste the soup for salt and add if needed. Serve soup in bowls and top with chopped scallion. Halona Black, M.Ed., is a Culinary Nutritionist and owner of Garlic & Lemons, LLC, a nutrition education and training company. Halona consults with corporations and community organizations that use cooking classes, digital media, and special events to illustrate how good food can impact health. She can be reached at chef at GarlicAndLemonsLLC [dot] com. This entry was posted on December 29, 2012 by Kwanzaa Culinarians in Recipe and tagged collard greens, Culinary Nutritionist, GarlicAndLemonsLLC.com, Halona Black, health blogger, likker, Pot Liquor, Roast butternut squash, soup, Sweet and Spicy Pot Liquor Soup.